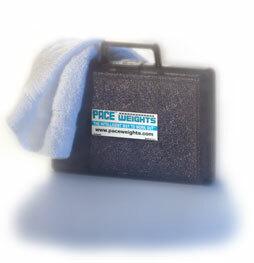 Pace Weight Limited Warranty - Winans Athletic Company sells Pace Weights online. Winans Athletic Company warrants to the original buyer, for a period of 60 days from date of purchase, that Pace Weights will be free from defects in material and workmanship. In the event of a defect, Winans, in its sole discretion, will repair or replace any defective part at no charge. Buyer is responsible for all shipping costs. This warranty does not extend to damage resulting from accident, misuse, abuse, abnormal use or causes beyond Winans' control. THIS WARRANTY IS EXCLUSIVE AND IS IN LIEU OF ANY IMPLIED WARRANTY OF MERCHANTABILITY, FITNESS FOR A PARTICULAR PURPOSE OR OTHER WARRANTY OF QUALITY, WHETHER EXPRESS OR IMPLIED. No person or dealer is authorized to make or extend warranties beyond those set forth herein. Correction of defects as set forth above shall be buyer's sole and exclusive remedy for defective goods, and the liability of Winans shall be limited to the cost of the Winans product purchased by buyer. Winans shall not under any circumstances be liable for direct, special or consequential damages arising from buyer's purchase or use of Winans' products.